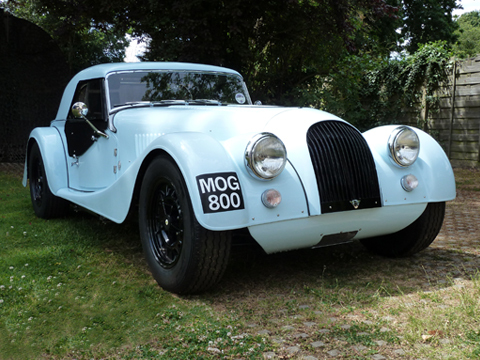 Here, you can easily view image and details of our range of bespoke Morgan parts and accessories. To begin, you can start with the products pages, or read and find about new products and our Lewis Racing exploits on the news pages, as well as browsing our photo gallery. Seen something interesting over there on the right, by clicking on one of the featured product images you will be taken directly to that product for more details. See, we did say it was easy...! Librands Founder, Rob Wells can help you with technical questions & carriage charges. We can even take your card details over the phone if you prefer. NOTE: Postage prices online are currently for UK and Europe. Just put the total amount in the "pay now" window at the bottom of the righthand sidebar of this page by my blue +8 MOG 800 picture and follow the instructions. It will come through to us as a custom payment. MOG 800 Rob Wells’ Plus 8 rebuilt by Lewis Racing/Librands & finished in 2009. Built on a Morgan chassis with a stainless bulkhead it has a torsionally strengthened chassis and stiffened stainless bulkhead. It runs a 4.2 Litre Rover V8 engine on SU carbs with a Walkinshaw crankshaft and a fast road hydraulic cam. Power drives through a works LT77 gearbox And a 3.7 BTR limslip axle. All round disc brakes are by Mulberry fabrications. It has our own design suspension, with wishbones at the front and coil overs with 5 link and rocker arms at the rear. Built originally with only a hardtop, we fitted air conditioning. Later adding a Simmonds hood. We designed the dash incorporating the heater and air con controls and a radio and CD player. Also adjustable face air outlets. Librands products included in the build. Stainless interior mirror and convex round door mirrors with stainless bases. Door checks and side screen steadies. +8 stainless performance manifolds and silencers with side exits. Clear flasher lenses and Cibie H180 head lamp units with Ultimate Nightbreaker bulbs. Sidelights incorporated in the headlights. Luggage rack and roll bar system with stainless road hoop.